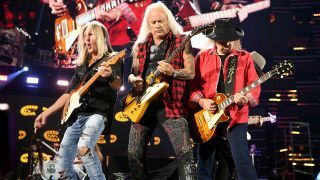 Lynyrd Skynyrd have announced that they’ll bring their farewell tour to the UK and Europe next summer. The band are currently on the North American leg of the Last Of The Street Survivors Farewell Tour – and they’ve now revealed they’ll play nine dates across the UK and Europe in June next year. Blackberry Smoke will support on the German dates, while Status Quo will open for the Southern Rock legends on the UK shows. Tickets will go on general sale on Friday (November 9) at 9am GMT, while a full list of dates can be found below. Speaking about the tour earlier this year, guitarist Gary Rossington said: “It’s hard to imagine, after all these years, the band that Ronnie Van Zant, Allen Collins and myself started back in Jacksonville, would resonate for this long and to so many generations of fans. Vocalist Johnny Van Zant added: “We’ve been blessed by these great songs and the messages they carry to the fans. Lynyrd Skynyrd released the album Live In Atlantic City back in September, which featured guest appearances from 3 Doors Down, Hank Williams Jr and Bo Bice. It was recorded in New Jersey in June 2006.